Personalise this Butterfly Drinks Bottle with a name up to 12 characters. The material of the bottle is aluminium and plastic. Within 5 - 10 days. Please call us on 0845 8030988 if you require this to be delivered more urgently. Please allow time for the items to be personalised. Thank you to everyone at Lucy Willow. We couldn't be more thrilled with the bed and bedside table that has just arrived for our daughter. The quality is superb and the design is gorgeous - with her name adorned too! It is every little girl's dream. Thank you. We are thrilled. Thank you SO much. You have a very happy customer. We ordered this chest of drawers for our little girl's bedroom (along with the Looby Lou bed, Pick and Mix wardrobe and bedside table), after falling in love with them all following a visit to the showroom!! The main thing that stood out was the quality of the furniture. Having looked at quite a few places for furniture Little Lucy Willow beat every place we'd been! All items are extremely well made and built to last. I would definitely recommend this company - the customer service was amazing and even better is the fact everything is from the U.K! Just to thank you and the delivery guys for all the hard work. My girls simply love their new room!! 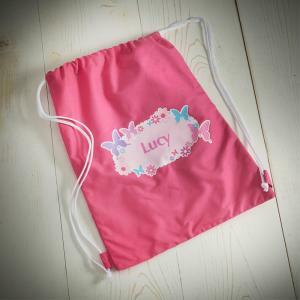 Personalise this Butterfly Swimbag with a name upto 12 characters. Pink drawstring swimbag. 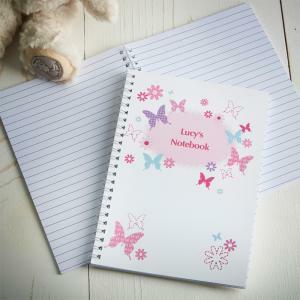 Drawstring closure doubles as shoulder straps Can..
Personalise this Butterfly A5 Notebook with 2 lines of 15 characters on the front. All notebooks contain 40 double sided lined pages. Due to the.. 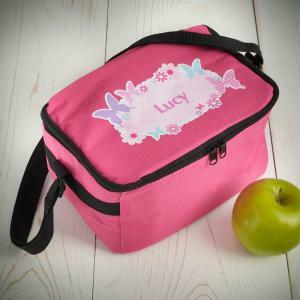 Send your kid's lunch to school in this funky Pink Butterfly lunch bag! Personalise this lunch bag with any first name up to 12 characters (please ..
Personalise this Butterfly Hardback A5 Notebook with 2 lines of 20 characters per line. 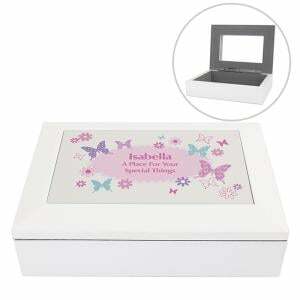 The hardback notebook contains approximately 96 double side..
Personalise this Butterfly White Jewellery Box with a name up to 12 characters and up to 2 lines of 20 characters each for a message. The Wooden Je..